Finding out the vacancy rate of an area can help you decide whether it is a good area to invest in and if it has the potential for short term growth. Today I should you how you can find out the vacancy rates of any suburb in Australia using nothing more than a property magazine I picked up for $9.95. 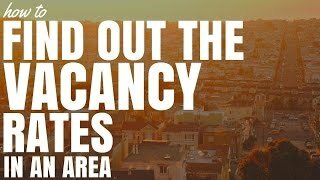 Knowing what the vacancy is in a particular area is an important statistic to know if you’re going to go ahead and invest in that area or even if you already own a home or investment property in that area. Vacancy rates can be a great indicator of potential future growth and an indicator of how your property is going to perform. Hi I’m Ryan McLean from OnProperty.co.au, your daily dose of property education and inspiration. Today’s episode is brought to you by BlueHorizonsProperty.com. If you’re interested in high growth positive cash flow properties with low vacancy rates then head over to BlueHorizonsProperty.com to find out more. So why are vacancy rates so important? Well firstly, vacancy rates will show you at top level the health of the particular area. They say that standard vacancy rates over healthy area hovers around to 2- 3%. So once you start to see vacancies of 4 or 5 or more than 5% then it is a red flag and calls for concern. It doesn’t necessarily mean that that’s not a good area to invest in it just means that you should do some more research. How are vacancy rates calculated? Well I don’t know the exact method used to calculate vacancy rates but there’s a variety of different business out there that collect and analyze real estate data to provide us with these details. My estimation is that vacancy rates would be analyzed by looking at properties on the market at any point in time versus rental properties in the area. So these statistics, these people tend to know everything about every particular property so they’re going to know if it’s an Occupy or if it’s rented and so by comparing what is on the market now available for rent to actually what is being rented out you can get rough assumption of what the vacancy rates are in an area. Now vacancy rates could indicate potential growth in an area. If vacancy rates are extremely low maybe 1% or 0.5% that means that there is a greater demand for properties then there is supply for people to actually rent those properties. And what happens when demand is greater than supply? Well in most instances the value of the property is going to increase and the value of your rental yield or your rental income is going to increase as well. Now obviously you need to consider a variety of factors in the area not just vacancy rate, things like new infrastructure, a growing population, what the economics of the area are like. You got to look at demographics and so forth but vacancy rates can give you a top-level idea of how the area is going. And you’re going to be going ahead and purchasing and investment property well then you want to know that that investment property is going to be rented. Because if it’s not rented then you are going to be missing out on a lot of money every single week. So how do we find out what the vacancy rates for an area are? I’ve got with me here the latest addition of Australian Property Investor magazine. So this is the March 2014 addition and it’s actually… you can pick up this magazine or you can pick up any of other investment magazines and you should be able to find in the back a list a vacancy rates for the area. You can see here, let me just go to it… we’ve got this page you can see all these columns but you can see right there vacancy rates and. So this will now show us all of the vacancy rates in an area. So let me turn the camera around and let’s get a better idea, a better view of vacancy rates and how you can analyze it in more detail. Today’s episode is brought to you by BlueHorizonsProperty.com. When it comes to investing in property sometimes it can be so easy to get really overwhelmed. You need to research and find the growth areas and find the right properties within them and that can be very difficult. All in all it can be recipe for disaster if you’re a new investor because one wrong move can cost you thousands of dollars. Coal an Helen from Blue Horizons Property are successful property investors who have massive property portfolio which at one stage was over 70 properties. They successfully predicted the boom of many different areas throughout Queensland and they now specialize in high yield, high-growth positive cash flow properties in Sorout Basin which is in Queensland. They act as a property partners to their clients giving them first access to new releases as well as helping them through the entire purchasing process. They personally invest in the area and many of their properties generate rental yields upwards of 10% with the added benefits of depreciation as well. Visit BlueHorizonsProperty.com and view their featured properties today. Okay so here we are, flipped it around so we can see it in more detail. As you can see it’s just three pages long so it’s pretty simple to use. The magazine then goes into more details that are really good as well about houses and has a section for units as well that shows you growth of the area and so forth. But let’s have a look at an area what the vacancy rate is and look at the growth that that areas had as well. So letís find an area where I used to live which is called Cronulla and so that’s in New South Wales and its 2230. So I wanted to look at that area, that is where I used to live in Sidney. We can see here this first column is how many properties is on the market for rent and this is a vacancy rate and this was in November 2012. So we can see that the vacancy rate is 1.6%. And now we can look at November 2013. So it gives you a year difference and we can see that there were 63 properties on the market and vacancy rates were 1.3%. So the vacancy rates for the area have actually gone down. You can see Gymea which is a few suburbs away from Cronulla, vacancy rates extremely low 0.5%, Janalli 0.4%, Easter Bay 0.9%. These are all within 10 minutesí drive of each other and so you can see extremely low vacancy rates there. We can look just over here we can see this suburb Barrington. I don’t know where that is but can see a 5% vacancy rate. If we go even higher and we’re looking at Whalan you can see it’s gone from a 6.7%t vacancy rate to a 14.9% vacancy rate. So big vacancy rate in that area and given that there’s only twenty properties on the market and that’s 14.9% I would expect that that would be a pretty small town. But as you can see you can just go through and you can look at all the vacancy rates. Now let’s have a look at and Gymea because this was the one where vacancy rates dropped from 1.2 to 0.5%. Let’s see if there’s any correlation with Gymea and prices in that area. So we flick over and we go here to MarketWatch houses and we go to New South Wales. Now we just need to find G for Gymea so flip over the page again the and (E, F, G and it’s going to be down here somewhere my finger is on it..) So we can see Gymea and what we’ve got he is we’ve got the numbers a property sold median price is $700,440 not a cheap suburb, three months growth, 3.5%, twelve-month growth, 12.6%, 3, 5.7, 5.8 and 3.3 over 10 years. We can see that the median advertise rate $580 for a week, gross yield is 4.2 an average days on market is 30. So we can definitely see some growth in the last three months and then in the last 12 months significant growth at 12.6%. Now that’s a correlation between rental vacancies it’s not saying that if the vacancy goes down then the price is going to increase but it is definitely something that you guys might want to consider if you’re looking at purchasing an investment property. So there you have a simple strategy for finding vacancy rates in an area. All you need to do is get one of these magazines Australian property investor, it’s going to cost you $9.95 at your local news agency, you can get subscriptions online as well. If you don’t have a news agency close to you because they’re probably all shutting down at this point in time but yes that will give you good access to some of that data at the end. I’m sure that there are some ways that you can find it online but at the moment I’m not 100% sure how you do that, that’s not something that I’ve covered but in the future I would definitely consider creating a video of how to discover rental vacancies using an online tool because I’m sure that if the data is in here in an old-school magazine then of course is going to be on the internet. It’s just whether it’s going to be available for free or whether we’re going to have to pay for it. So until tomorrow when I speak with Wally Gabriel from Granny flat solutions and we talk about the benefits of investing in granny flats and then the following day which we walk you through step by step exactly how you can invest in a granny flat and let me tell you sounds pretty easy. So until tomorrow remember that your long-term success is achieved one day at a time.